Last week I ran over my cat, Owl, and this week CC, my clinic cat, died of old age. Owl and CC were both old souls and I believe they both made a choice to move on to a better life. Last fall I went in search for a male kitten to keep Owl company since CC was too old to play with him. Instead of 1 male kitten I ended up with 2 females. Isn’t it interesting how God knew I would be needing 2 kittens. These kittens have been a delight from the minute they arrived. They settled in immediately and are about as uncomplicated as cats can be. 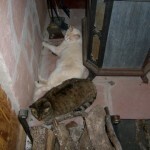 Both are sweet, Earth temperament kitties and they see my role in life as making sure they have plenty to eat. They will hang out with me as I work but the minute I get up they both go flying towards the feeding area always hopeful a snack might appear. They look like little bumper cars sliding on the concrete floor and bouncing off each other in a mad dash for dinner. Obviously snacks don’t appear every time I get up but these kittens are eternal optimists. I believe God gives us what we need, often before we need it and certainly when we don’t even know we need it. Watching these kittens has helped me keep my faith and optimism in the face of temporary setbacks and sadness. In proverbs 3:5 the message is “Trust in the Lord with all your heart and lean not on your own understanding”. I will certainly miss Owl and CC but I realize I have to trust that God knows what is best. Owl had constantly sore ears that I was not able to heal and even as I was digging his grave I felt his energy singing ” I am free, I am free and my ears don’t hurt”. CC was very old and she simply stopped eating. She slept more and more and eventually just slept. I asked her to please pass close to the house so I would know when she was gone. When she passed I felt from her a very clear “Thank you but Owl is still hanging around so I am going to move right on”. 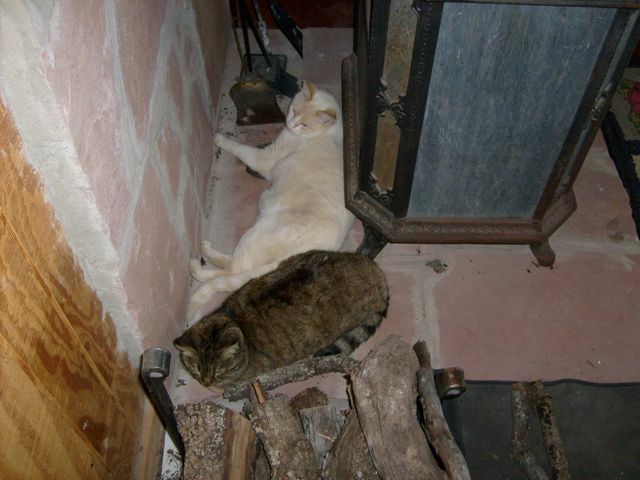 This entry was posted in Other Stuff on March 3, 2011 by Madalyn Ward, DVM. Dear Madalyn, I am so very sorry for your loss but knowing Owl and CC are together and having the comfort of the 2 P’s I hope makes the loss slightly more bearable.